I first learned about El Parian Restaurant prior to Mike Schneider’s 2007 edition of his annual Franklin Avenue Great L.A. Walk, which that year traversed Pico Boulevard from Central Avenue east of downtown all the way to the Pacific Ocean. 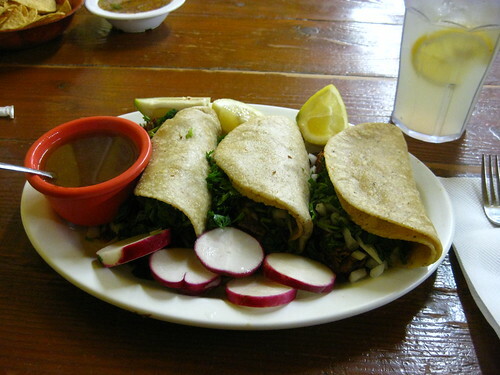 Prior to the big day he had been researching potential eateries along the way and posted that the place was reputed by none other than the L.A. Weekly’s Jonathan Gold as one of his faves in the entire city and home to some of the best goat tacos ever. As with most of the other walkers that morning I passed by the place and as it was early yet and I wasn’t too hungry passed up the opportunity to find out for myself if Gold was right. Though I most certainly could go OMGing to the nth, I’ll let the picture do the talking and refrain from belaboring this post with any rapturous exclamations. But I will part with these tidbits of helpful info: These are not your buckanaquarter truck-sized tacos. Had I paid more attention to the price of $2.85 each I would’ve realized that and thus recognized I probably didn’t need three — not because they weren’t worth it, but because I had to bike me and my taco-filled tummy another five-miles afterward to get home. Glorf. I already wanna go back. I can’t recall ever eating goat. How does it differ from, say, carne asada? A little gamier, perhaps? That’s some good looking chow right there. That’s was my first time eating goat as well Burns. Basically if it’s a little gamier the seasonings and spices of the broth it simmers in conspire to minimize any gamey taste. On the carne asada tip I’ve heard raves about El Parian’s carne asada as well so I plan to most certainly try one of those, too. I love chivo. You can buy it fresh at Grand Central Market downtown.